There’s a new way to find out someone’s age without asking. One just need to ask how many gears that person had in his first car. 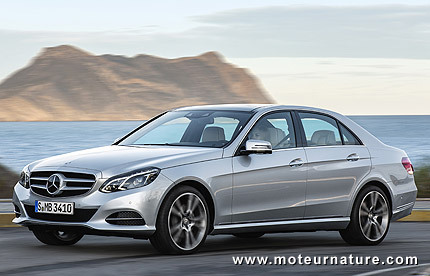 It was unimaginable when four speeds were the norm, but Mercedes has just unveiled a new car with an incredible nine speed transmission! It is a conventional automatic gearbox, with a torque converter. The engineers could have designed a dual clutch unit, which could have been a bit more fuel-efficient, but for a large limousine where comfort and smoothness are a must, a torque converter was better suited. 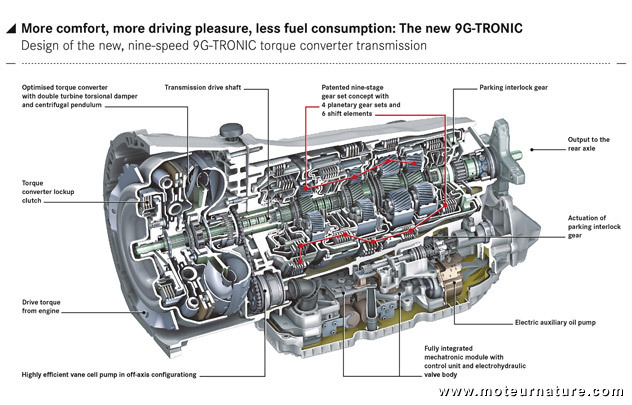 Gear changes should be plentiful with a nine-speed transmission so smoothness was an imperative, but more than that, it is the incredible spread of ratios which characterizes this 9G-Tronic transmission. An average car, the Peugeot 208, has a 3.42 first gear ratio, and fifth gear (top gear) is .77. That makes a 4.44 spread between the shortest gear and the longest. Mercedes’ old 7G-Tronic (seven speeds) was much better, going from 4.38 to 0.73 which gives a spread of ration of 6, but this 9G-Tronic is in all different league. Spread of ratios is a never seen before 9.15! It means that, if the engine allowed it, the car would drive at the same speed 7320 rpm in first gear, or at 800 rpm in ninth gear. 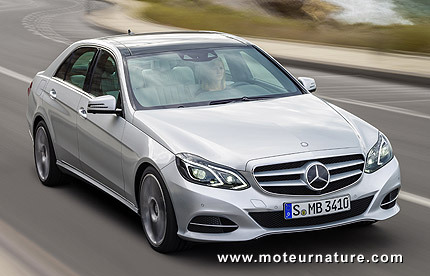 The 3-liter V6 diesel is not a high-revver, but it’s torquey down low, and that’s what matter here, since this Mercedes E350 Bluetec 9G-Tronic drives exactly at 55 mph with the diesel at 1000 rpm in ninth gear. It’ll be be good for driving on the autobahn. Driving at 100 mph, the engine will be at a cool 1800 rpm. Speeding? How could I’ve been speeding with my engine running so slow, officer? 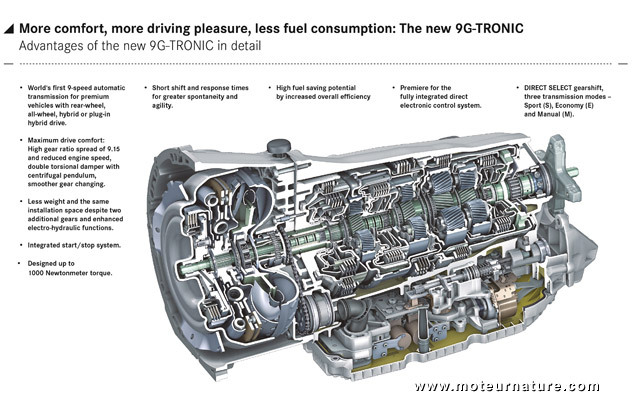 This transmission is also a great technological achievement, since it’s not larger than the 7G-Tronic, and it’s lighter. 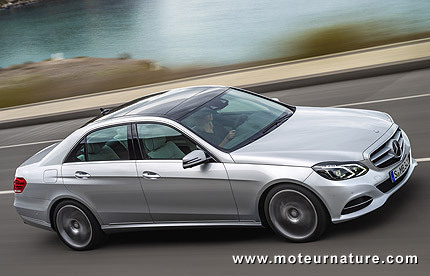 The 9G-Tronic is introduced in the diesel E-class, but it should be soon used in other Mercedes models with big low-revving engines.